Join us for Watershed's Coffee House! 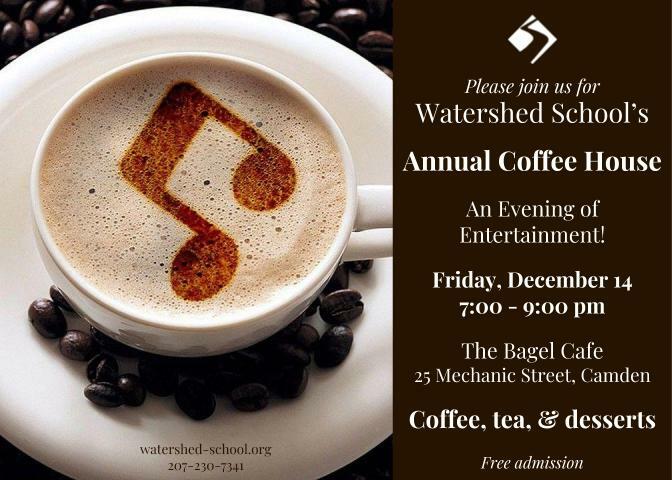 Watershed School will hold its annual Coffee House on Friday, December 14 from 7:00 – 9:00 pm at the Bagel Café in Camden. Each year, students, alumni, faculty, and community members come together for Watershed’s unique version of a talent show and a fun evening of entertainment. This year, the event will be produced and directed by Junior Pearl Benjamin and Sophomore Morgan MacDougal, with Sophomore Caleb Edwards as emcee. Desserts, coffee, and tea will be served. Admission is free, and the event is open to the public.